Citroen is giving its C5 range a refresh with revised styling, technology upgrades including a distinctive new LED light signature, darker tinted rear light clusters, re-homologated engines and the introduction of the Citroen's innovative new eTouch Emergency & Assistance System. The model upgrades apply to both saloon and Tourer versions and are available from November 2010. The visual changes to the C5 range are subtle with standard specification now including specially designed LEDs that have been neatly integrated into the headlights to give the model a distinctive new 'visual signature'. The rear light clusters also get from a new ‘Dark Crystal' treatment with clear glass in the central section. The headlamps retain all their existing functionality and the models safety-enhancing cornering lights remain standard specification across the range. 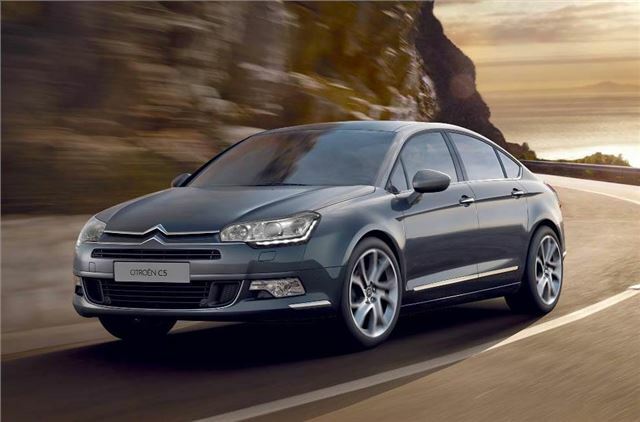 The revised Citroen C5 range now benefits from a full Euro 5 compliant engine line-up with the introduction of the 1.6HDi 110bhp Euro 5 to replace the Euro 4 version. The 1.6i THP 155bhp petrol engine - available in saloon form with VTR+ NAV trim - and the 3.0HDi V6 240bhp Auto Exclusive (saloon and Tourer) have been re-homologated and now offer improved fuel efficiency and lower CO2 emissions. Combined cycle fuel economy increases from a claimed 39.8mpg to 42.2mpg while the Tourer improves from 38.2mpg to 39.2mpg . CO2 emissions are also down 14g/km and 6g/km respectively, resulting in reduced BIK tax rates for both models (down 3 bands for the THP 155 and down 2 bands for the HDi V6). The first year VED for the THP 155 model changes from band H to band G.
Standard specification on all C5 Exclusive models, customers now benefit from the introduction of Citroen's new eTouch Emergency & Assistance System. This innovative service automatically or manually makes emergency calls and allows manual assistance calls - using a built-in SIM card - for a rapid response in the event of an accident or if the car is immobilised. Citroen's eTouch system also allows drivers to consult information online at their ‘MyCITROEN' personal space, which allows them to monitor their vehicle's maintenance requirements and to receive advice on improving fuel economy. These services are free and available 24-7.